Gasp! Don't be too shocked, but this is a review, and not one that I had committed to (although I do have another one of those coming up early next week so there will be another review here soon). 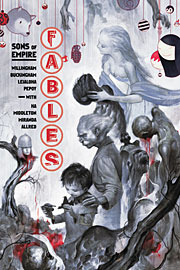 The main reason I am making an effort for this book is that I have reviewed all of the other Fables stories that I have read so I don't want to break my record and because I would never be able to rely on my memory alone to remember all the individual stories that are included in this collection. The first story in this collection picks up the action in the Homelands. After the bitter defeat that the Adversary's troops experienced in previous collection, the Homelands leaders come together more determined than ever to find a way to defeat the fables who live in Fabletown and they have no concern whatsoever about any collateral damage to the mundys who also live on Earth. First though the reader is introduced to each of them. Some we have met before like the head of the knight Bright Day but others are new - Lumi the Snow Queen for example. One of the more important seems to be Hansel (yes, the one usually associated with Gretel) who has previously been banished from Fabletown but is to be now sent back as the Adversary's political representative. In due course, we find out why he was banished in the first place - an unpleasant tale in itself. Interspersed with these introductions is a little story about Red Riding Hood going to get a haircut. By the time we got to the end of the story I got why it was there, and eventually there were more clues as to why it was important, or more precisely why one particular character's reaction to said haircut was important, at first it did feel a little incongruous being placed where it was. Heading back to the Homelands, and it is time for a brainstorming session about the fate of Fabletown (and Earth) with one of the solutions being suggested being four plagues - Pestilence, Fire, Winter and Famine. Whilst the more dastardly of the assembled group are all for this, there are a couple of voices of reason, not the least of which is Pinocchio. He is under a compulsion spell that means that he must remain loyal to his father, but that doesn't stop him from suggesting that the humans will not be quite as easy to beat as all of the others seemed to think. Whilst this thread about the future dominates the first half of the book and so is relatively easy to talk about, it is the other parts of the collection that make it difficult to review. While I have talked on numerous occasions about needing to read in order, there are so many subplots that we just get the briefest of glimpses of in this collection but that hark back to previous books. For example, we have just a couple of pages about Jack getting into mischief again, and just a couple of pages about a human reporter who is sniffing around Fabletown. In and of themselves they don't necessarily move the story forward in great leaps and bounds, but they do tie previous storylines to this collection and I expect, in due course will be easily identifiable as the foundation that future story developments were built upon. One of the things I liked about this collection is that there were some short stories where we got to meet some of the other characters who live in Fabletown. The first of these was about Rapunzel, who must always keep on the move, not being able to stay in one place for more than a couple of hours because her hair grows so quickly that mundys would notice if she didn't keep moving. In other short stories, there was also lots of kissing various animals in the hope of meeting a handsome prince or princess (not always successfully), the three blind mice searching for paradise, recruits to the mouse police on parade and so much more. I loved spending more time with Bigby and Snow and their charming brood of kids (as always! ), even when Bigby was being all dark and broody because he had to go and visit his father. I particularly enjoyed the Christmas story which explained to the cubs how Santa Claus manages to get all round the world in one night. It would have been such a joy to receive the Christmas cartoon when it was published as a single magazine. I wasn't as keen on some of the more intense stories. I know that we are building up to the big confrontation between the Adversary and the fables who live in Fabletown but there were a few times where that build up just felt relentless. Whilst I generally enjoy the developing storyline around the big upcoming confrontation, it really is the more whimsical elements that I enjoy the most. What the creators of this series do manage most of the time is to get a mix between the more light hearted storytelling and the dramatic big storylines. The last few pages of this collection are a perfect example of this. The team chose a few of the thousands of questions that they have been asked over the years that they have been doing the Fables cartoons and they did a few short stories to illustrate the answers - so much fun! Questions like what is Boy Blue's favourite song, who was Prince Charming's first love, how does Bufkin keep getting hold of the alcohol and who caught the bouquet at Snow White's wedding! Such fun! The free Fables living in the mundane world have struck a decisive blow against the Adversary, destroying one of his most valuable assests at the very heart of his empire - and setting the stage for an all-out war between the worlds in the process. Now, while the rule of the Homelands licks his wounds and gathers his forces, the denizens of Fabletown have a rare chance to savor the brief peace their victory has brought them. Everyone, however, knows that this is just the calm before the storm - and that even the winds themselves will have to choose sides before it's over.